by Schow, Ronald L.; Nerbonne, Michael A. A renowned team of experts presents a thorough introduction to aural rehabilitation across the lifespan. 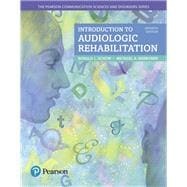 Introduction to Audiologic Rehabilitation provides a cohesive introduction to the basics of audiologic rehabilitation in an easy-to-read style that resonates with undergraduate students. Highly regarded as experts in the field, the authors introduce the fundamentals, present the important methods and procedures, and include two case study chapters that address the rehabilitation needs of both children and adults. They examine the changing state of audiology through coverage of important contemporary issues such as professional documents, evidence-based practice, multicultural issues, and advances in computer and web-based rehabilitation activities. Based on a proven model framed within the concepts of the World Health Organization, this book helps students prepare to provide high-quality, state-of-the-art services to clients of any age. The Seventh Edition features an enhanced focus on cochlear implants in Chapter 3 and revised discussions of vestibular and tinnitus treatments. New chapter learning outcomes, supplementary learning activities, references, and recommended websites keep readers focused and engaged with the material. Ronald L. Schow is co-author of Communication Disorders of the Aged and six previous editions of this text. He is Professor Emeritus of Audiology at Idaho State University where he continues to be involved in writing and research. His publications include the 20 most important refereed articles which can be located on Pub Med www.ncbi.nlm.nih.gov/pubmed. He is co-author of Multiple Auditory Processing Assessment (MAPA) available through Auditec of St. Louis. MAPA is currently in the process of a national normative study by Academic Therapy Publications, Navato, CA. He is a charter member of the International Collegium of Rehabilitative Audiology in which he has been involved since 1988. Schow received his Ph.D. training at Northwestern University where his major professor was Raymond Carhart who named the profession and who is considered the Father of Audiology. Michael A. Nerbonne received his Ph.D. at Michigan State University and is Professor Emeritus of Audiology at Central Michigan University. He has published widely in professional journals, is co-author of Communication Disorders of the Aged, and is co-editor of seven editions of Introduction to Audiologic Rehabilitation. In addition to his ongoing commitment to audiology, Nerbonne is focused on family time and fishing.